iPhone 6 is worlds apart from the iPhone 5s when it comes to recording slow motion videos using the slo-mo feature. How apart are we talking about? 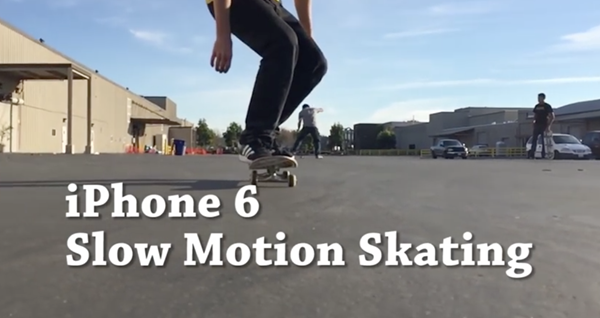 Let’s have a look at some skateboarding footwork in super slow motion, recorded using the iPhone 6, and no, this is not a video from Apple. You must have seen skateboarding pros perform the much awed-at kickflip where the skateboard is kicked into the air, and flipped just in time to land on. This whole process is rather a frantic one to the naked eye, and watching it on a TV or YouTube doesn’t really do justice to the magic which the trick essentially carries. Call it skill, but when seen in slow motion, your perspective shifts a bit where the finesse of the kickflip is suddenly awakened. The iPhone 5s sports one of the finest cameras to be available on any smartphone today, and even though the iPhone 6 and especially 6 Plus are one complete generation ahead, the rear-shooter on both the devices can be reasonably grouped together in terms of photo results. However, it’s the increased processing power of the iPhone 6 which gives this device the ability to capture slo-mo videos at a whopping 240fps in contrast to 120fps on the iPhone 5s. So naturally, users are able to produce videos that are significantly smoother, and detail-rich. The video in question comes from YouTube user, Braille Skateboarding, but this wouldn’t be the first time such a reel has been uploaded to the Internet, however this one does manage to get you pause and abandon all what you’re doing for a second, because the motion it captures is just that alluring. Earlier, a very short documentary was shot using the iPhone 6, with portions of the film utilizing the iPhone’s slo-mo feature to great effect resulting in some brilliant moments. There was also a clip of wine being poured into a glass that made a few rounds on the Internet, showcasing the 240fps slow motion prowess of the iPhone 6, shortly after the latest smartphones from Apple were released in September. If you don’t use the slo-mo feature that frequently on your iPhone 6 / 6 Plus, some of the videos I just mentioned might change your mind. Always the same trick… Not very interesting… However Slow-mo mode is the best way to show sports performances!